This course is part of the IACIS Training in Orlando, Florida. 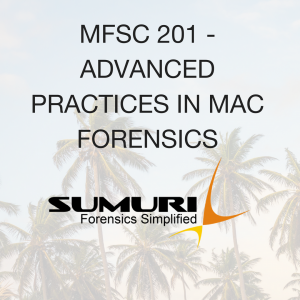 This course was designed to provide unparalleled vendor neutral and tool agnostic instruction in advanced topics relating to the forensic use and analysis of Apple hardware, technologies, and applications. The training is designed for the participant to learn in a team-work environment and is taught by instructors who maintain a “no one left behind” attitude. In addition, complicated topics are made easy to understand through instructor-led exercises and real-life scenarios— supported by a quality student manual to be utilized as a supplemental resource at the completion of the course.